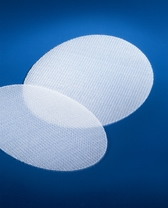 Rigid flat, oval preshaped mesh. Can be used in the repair of inguinal hernias as an alternative to the Kugel technique, by retropubic insertion via the front approach. The mesh does not need a pouch or ring as its rigidity allows finger positioning and distension against the posterior wall of the inguinal canal.